Just a 45-minute plan journey from Dubai, the Sultanate of Oman feels somewhat other worldly. With its rugged, mountainous landscape and shimmering, uninterrupted Gulf of Oman there is not a skyscraper in sight. The Chedi Muscat has carved out a reputation for itself as the very best in luxury hotels in Oman’s capital of Muscat. Rising from the landscape, the traditionally styled contemporary property offers 158 Omani influenced rooms, suites and villas each offering a differing panorama across the immaculately designed resort. It is the overall feeling of Zen that really sets this hotel apart. For those looking to get away from it all without travelling very far, The Chedi Muscat is the place. But let’s first talk about your locale. Muscat is a city of contrasts; from the frenetic souks scented by frankincense to timeless fortresses, vast deserts and romantic seascapes, the diversity of opportunity for exploration is exceptional. Adventure seekers can seek out and summit Oman’s highest peak Jebel Shams or hike to remote mountain villages where artisans still craft traditional pottery by hand whilst culture vultures must visit the central Corniche as the sun sets when the lights come on around Muttrah’s souk, a hive of activity late into the night. There is so much to see and do here that a weekend is simply not long enough. From the vibrancy of the city back to the peaceful serenity of The Chedi, you’ll find yourself meandering through the landscaped garden oasis more than once a day if only to take in the magnificent views that seems to change with every hour according to the position of the sun. Walking into the lobby of The Chedi Muscat, your eyes take a while to adjust to the changing light. A dimly lit vast expanse of marble and curved archways set off by an impossibly beautiful low-hanging light structure hanging over a focal seating area. It’s a dramatic first impression and sets the standard for the rest of the resort. Stepping outside into the Arabian Sun on the way to your room, the surroundings leave you awe-inspired – it looks like something out of a film set. White domed low-rise buildings dot the vibrant gardens, water ponds separate each area and large shaded stone gazebos lie in perfectly symmetry with each other to make the most of the view from each angle you turn. The stone path twists and turns in each direction, depending on which accommodation you are staying in. Boasting either views out towards the resort itself or across the white sands of the beach, each room or suite is perfectly appointed for even the most discerning of travellers. These rooms have been designed to heighten the overall feeling of calm that you get just from simply being at The Chedi. Drawing attention to the elevated Chedi Club Suites that have a prime seafront position are located just a stone’s throw away from the swimming pools, main lobby and restaurants, you’re offered a panoramic view of the resort from the private balcony, complete with sun loungers for good measure. Expansive in their size at 721 square feet, the soaring ceilings and oversized windows flood the space with natural light, further complemented by a neutral, Asian style décor. It’s minimalism Omani style. A separate living area, complete with fully stocked bar and 42-inch flat screen TV leads to both the balcony from one side and the sensuous bedroom on the other. A King Size bed takes pride of place in the middle of the room, furnished with a flurry of soft metallic cushions and flanked either side by two enormous full-length mahogany mirrors giving the illusion of yet even more space. Large candelabras line the sides of the rooms and pay homage to the theme of slumber-inducing light that curates an air of slumber-inducing calm across the entire resort. The adjoining bathroom is among the best we’ve had the pleasure of experiencing in our years as travel writers, with an open-plan design and a smoked black marble terrazzo sunken bathtub and separate powerful rain shower laden with luxurious bath products. Whilst appearing somewhat minimalist in its style, don’t let the lack of adornments fool you, The Chedi ensures that each guest is fully catered for with two interactive flat-screen TVs, a Bose Sound Dock with digital music system and almost obligatory Nespresso Coffee Machine as standard. An added benefit of the Club Rooms & Suites is access to The Club Lounge itself. Feeling more like a library than a traditional Club Lounge, this space – accessible only to those that are staying in one of the namesake rooms – is a sanctuary of peace & quiet throughout the day. In fact, it’s so quiet you’re almost afraid to indulge in a spot of animated chatter that normally echoes through these type of lounge come ‘happy hour’. The Club Lounge serves up a daily afternoon tea and evening cocktails and canapes which can be a welcome addition given that the menu prices at The Chedi are notoriously steep. Other notable inclusions exclusive to these Club Rooms and Suites include return airport transfers in a comfortable, private limousine, daily breakfast served in either the main restaurant or in the privacy of your room, complimentary mini bar including alcoholic beverages, daily fruit basket, daily newspaper, complimentary laundry service and that all important complimentary wi-fi. 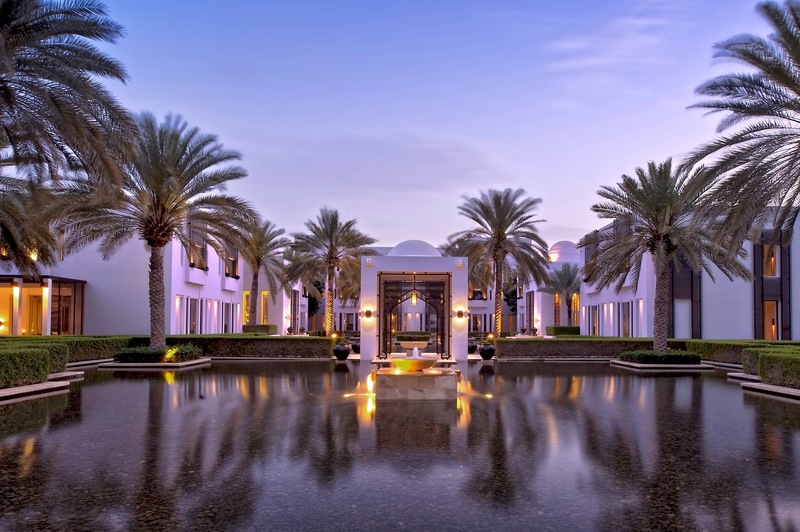 The timeless environment continues through The Chedi Muscat’s manicured grounds. Although it’s easy to not see another soul whilst staying at this resort (perhaps the ultimate luxury? ), the well-healed guests that you do encounter are often spotted snapping photos of the unique architecture of the hotel which only seems to get better with each area you encounter. Perhaps one of the most famous shots of The Chedi Muscat is that of the Long Pool. As its name suggests this 103-metre narrow swimming pool is the region’s longest by far and although open throughout the day, is best enjoyed at twilight when the surrounding fire pits are lit and cast an orange glow over this architecturally designed feature. Day beds line either side of the pool, perfect for reading a book or stretching out under the Arabian sunshine as the hours pass by. The resort has three outdoor temperature-controlled swimming pools, each offering a different energy and view. The beachfront Chedi Pool is adults only and offers lots of shaded space for shelter when the temperature. Adjoined by the Chedi Pool Cabana, a beachside restaurant that offers an eclectic menu or lunchtime and evening light, Mediterranean meals. The family-friendly Serai Pool is completely shaded from the elements and offers a more secluded swimming experience with its black mosaic design and elegant canopied design. From the palm fringed gardens and wealth of leisure and wellness facilities (as well as the largest spa in Muscat), to the excellent dining that The Chedi Muscat offers. Predominately an outside resort, the alfresco spaces for drinking and dining are clearly picturesque and are best enjoyed outside of the summer months. That being said, air-conditioned restaurants have never looked so good. With six restaurants and two lounges at The Chedi Muscat, great cuisine is a given. With international menus from the Mediterranean to the Middle East and India, The Restaurant is as stylishly designed as you would expect from a world that has paid some much attention to its aesthetical detail. The vision of renowned Japanese interior designer, Yasuhiro Koichi of Design Studio SPIN, The Chedi Muscat’s main restaurant is not your average all-day-dining venue. A fusion of clean Asian interior, Omani architecture and stunning focal elements such as the collection of contemporary crystal chandeliers hanging from the vaulted ceiling, The Restaurant is a destination within itself. Four open show kitchens add a sense of theatre to the experience and evenings are well spent enjoying delicious fare to the melodic sound of live piano music. It’s the only space in the resort that really seems to bring everyone together, to unite in their breathless excitement at having the privilege to dine in such an impossibly beautiful space. There’s even an indulgent Friday brunch with free-flowing champagne should your stay fall over a weekend…. From the sophisticated style of indoor dining back time spent under the stars, The Chedi Muscat offers so many options for al fresco lounging (and dining) that’s its near impossible to choose. The Arabian Courtyard (open from October-April) makes the most of cool desert nights where you can unwind on plush cushions under the star filled Arabian sky in your very own outdoor courtyard, accompanied by authentic Arabic mezze selection and traditional shisha pipes. Another seasonal beauty is the Beach Restaurant that epitomizes the phrase “dining with a view”. Set along the resort’s 370-meter private beach, a menu of freshly caught seafood is accompanied by a sublime panorama of the Gulf of Oman. Here, soak up the sea breeze and salt-infused air of the expansive waterfront patio or gaze out from the high-ceilinged dining room. Wherever you choose to dine at The Chedi Muscat, you won’t be disappointed as the quality of food is excellent. The Chedi Muscat is a place of calm; it’s a place that transports you both back in-time and to the future, through its stunning architecture. It manages to completely set itself apart from any other hotel in the region with its dedication to remaining an exclusive bolt hole of those that are looking to ‘get away from it all’. Those looking for an abundance of nightlife will be disappointed but those looking for a base to explore the cultural delights of this fascinating country will find that they arrive guidebook in hand, to quickly discover that the only map they need is one of the resort itself, for The Chedi Muscat is so beautiful, such a haven of tranquility, that you won’t want to leave even for a second. With each twist and turn, there is something new to see, another view to drink in and another hour of contemplation to be had.